ANAHEIM, California – At Winter NAMM 2016, dbx by HARMAN is debuting seven powerful additions to its popular 500 Series line of signal processing modules. Perfect for studio, live sound and mobile recording applications, the 500 Series modules and PowerRack 500 Series chassis are compact, portable and highly modular. They also offer excellent features, control, sound quality, and the highly sought-after warmth and usability of analog signal processing. The new dbx 540 is a single-slot 500 Series tube microphone preamp that boasts pristine audio output, superior-quality high-end design at a value price. The dbx 540 features a Class A tube preamplifier, switchable phantom power and a super fast in-line optical compressor. The interchangeable 12AX7 preamp tube allows users to experiment with a variety of modern and vintage tubes for creating a customized sound. 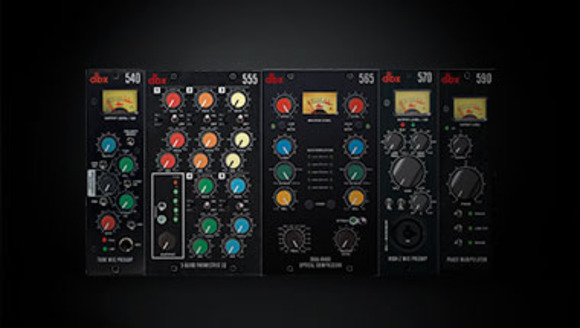 The new dbx 565 is the ideal 500 Series dual-channel optical compressor for the discriminating user. The 565 features a dual-channel multi-frequency-band optical compressor, Linkwitz-Riley 4th-order (24dB/octave) crossover slope, Master level display with VU meter, Gain reduction LED, Independent compression, Attack and Release controls, and a Circuit bypass switch. Finally, the new 555 5-band parametric EQ, the 570 High-Z input and the 590 Phase manipulator will join the current dbx 500 series line offering a full range of processing tools for recording and live sound. Also new at Winter NAMM 2016, the new PowerBlock3 and PowerRack3 both feature power sources designed to house up to three 500 Series modules. The rear panel sports three slots of balanced XLR inputs and outputs along with three slots of unbalanced ¼-inch inputs and outputs. A 48V phantom power switch is located on the front of the rack for easy access. The chassis are designed to be fully compatible with the 500 Series format, but in two different compact orientations–horizontal and vertical, respectively. HARMAN (harman.com) designs and engineers connected products and solutions for automakers, consumers and enterprises worldwide, including connected car systems, audio and visual products, enterprise automation solutions and connected services. With leading brands including AKG®, Harman Kardon®, Infinity®, JBL®, Lexicon®, Mark Levinson® and Revel®, HARMAN is admired by audiophiles, musicians and the entertainment venues where they perform around the world. More than 25 million automobiles on the road today are equipped with HARMAN audio and connected car systems. The Company's software services power billions of mobile devices and systems that are connected, integrated and secure across all platforms, from work and home to car and mobile. HARMAN has a workforce of approximately 28,000 people across the Americas, Europe, and Asia and reported sales of $6.4 billion during the 12 months ended September 30, 2015. The Company’s shares are traded on the New York Stock Exchange under the symbol NYSE:HAR.